Charge and Save at Home! We are rolling out rebates of $300 combined with low off-peak rates for residential members who install qualified Electric Vehicle (EV) charging stations at their homes. NHEC will provide rebates of $300 to residential members who install Level 2 EV charging stations (240 volts) in our service territory. Rebates will help offset the cost of installing a second electric meter that will record your EV charging usage AND let you take advantage of a low off-peak rate when charging your EV. Your potential savings will vary depending on the type of EV you drive, how many miles you drive and when you charge, but the owner of an EV like the Chevrolet Bolt who drives 16,000 miles a year can save about $20 a month by charging during off-peak times. Already Have a Level 2 Charger? 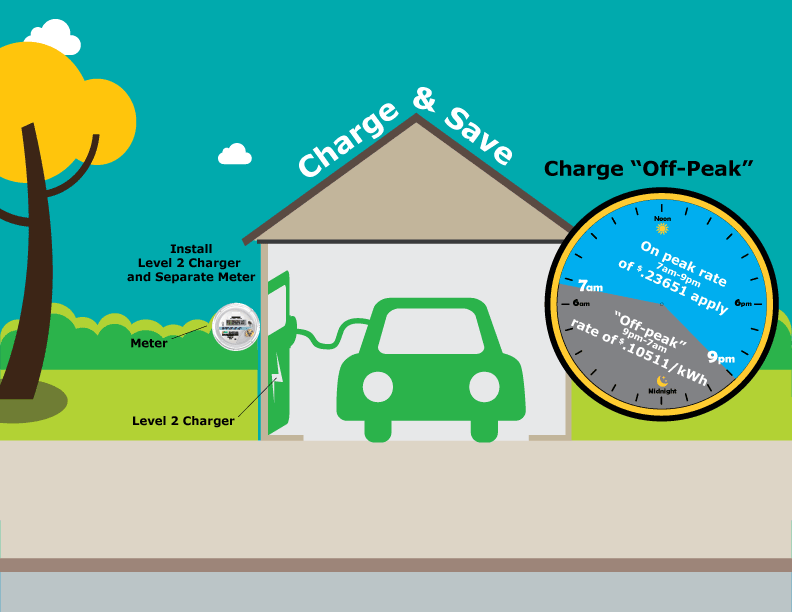 Members who already have a Level 2 EV charger installed in Co-op service territory are also eligible for the $300 rebate if they sign up for off-peak charging! All hours, all days 9 p.m. – 7 a.m. Monday – Friday; all hours on weekends and holidays 7 a.m. – 9 p.m.
*EV rates do not include monthly meter charge of $3.10. On-Peak and Off-Peak EV charging rates will change with the regular seasonal rate adjustments that occur in May and November. For current rates, see Billing & Rates at www.nhec.com.